If you are a chaat lover, you cannot not like Ragada Patties. In Hyderabad, one cannot miss the unmistakable aroma wafting from every street corner where there would at least one vendor dishing out this wonder street food! But there are a few well known joints where the taste has been nearly the same over the past two decades or so. Chaat lovers as we are, this appears on our menu quite often but I rarely get a chance to take a click! My older one who is slowly getting addicted to these types of street food is showing great promise :). Here is the recipe I follow, for Day 3 Week 4 of BM #26. Note - I didn't have sev in my pantry when I took these pictures and so looks like I used some store bought mixture which has some puffed rice as well! Also the Ragada is usually a little runny unlike what appears to be a thick ragada in the picture. Wash and soak the dried peas for about 4-5 hours. Pressure cook them so they result in tender peas. In a wok/kadai heat oil and add cumin seeds. After they pop, saute the onions until golden brown. Add the ginger-garlic paste and fry for a few seconds. Add in the Dhania-Jeera powder, turmeric, Red Chilli powder, Chaat masala, salt and add a cup of water. After the mixture comes to a boil, add the boiled peas, tamarind paste and mix well. Mix well and adjust the taste and consistency as needed. Mix all the ingredients except the bread crumbs. Make about 12-15 portions of the potato dough. Flatten each portion into a thick disc and set aside. Heat the griddle and dip each of the patties in bread crumbs and arrange them on the griddle. Add as much oil as needed to cook on both sides of the patties. After both sides are brown enough, remove and continue the same process for the remaining patties. In a serving plate, arrange couple of patties and pour the ragada on it. Add some tamarind date chutney and beaten yogurt. Sprinkle chaat masala and black salt. Sprinkle chopped onions, sev and chopped coriander leaves and serve them piping hot! Check out the Blogging Marathon page for the other Blogging Marathoners doing BM#26. Linking this to Kid's Delight hosted at Simply Tadka. All these street foods are stirring up lot of memories at home! I made these to satisfy my husband's cravings :). He has been telling me about the time when he used to eat these bajjis sold by street hawkers near one of the beaches in Chennai, India. From what my husband told me, I gathered that the plantain used is a different variety and so there was a definite difference in taste. Nonetheless he was happy to relive some of his memories. In fact this time my kids also formed part of the audience for his nostalgic narration :). The kids also had fun munching these. Sample these bajjis as part of Day 2 Week 4 of BM #26. Prepare the batter by mixing the chickpea flour, salt, ajwain, red chilli powder and adequate water to get a pancake batter consistency. Beat the batter and set aside. Peel the plantain and slice them vertically into thin slices. When the oil is at the right temperature (a drop of batter put in the oil should rise to the top immediately), dip the plantain slices in the batter and fry until golden brown. Fry them in batches until all the slices are done. Sprinkle black salt and serve with some chopped onions. The last week of BM #26 is all about Street Food which is kid friendly. I have been dreaming of Bread Sev for quite sometime now. Once upon a time I used to patronize a street vendor who used to make this amazing Bread Sev. In the later years, it had become an addiction to my husband and mother-in-law as well. The other day when I was discussing the different kinds of chaat we used to enjoy back home, Jaya (my dear sis) said that she had recreated and was very happy with the result. That gave me the dreams and the idea to enjoy it all over again !! Since my older one is a chaat freak (Aren't we all?? ), it was a dream come true, so to say. She was like 'How come you never made this for so long?'. I assured her that this would appear as her after-school snack often. Since it is very easy to put together, don't you agree it was an easy promise to make?? Here is Bread Sev for Day 1 Week 4 Of BM #26. In a pan, heat oil and cumin seeds. After the cumin seeds crackle, saute the onions until they are golden brown. Reduce the flame and add the tomato sauce, salt, mirchi powder and the mashed potato. Mix well and sprinkle the dried mint powder. Remove from fire and set aside. Toast the bread slices and apply butter to your preference. Spread the Coriander-Mint Green Chutney. Next spread the mashed potato curry, then the Tamarind-Date Chutney, beaten yogurt, grated carrot, chopped onions, coriander leaves and sev. Add any other toppings of your choice and serve immediately. We grew up eating this delicious salad called Kosambari or Vada Pappu. It is made traditionally for all festivals and auspicious occasions. I remember that I used to scoop out the salad from the main pot at the end of the meal along with the juice which oozes out! With such memories haunting me today, here is a visual treat for you all..For Day 3 of Week 3 of BM # 26. Wash and soak the Moong dal in enough water for a couple of hours. Drain and transfer into a mixing bowl. Add the chopped cucumber, grated carrot, green chillies, salt and lime juice. Sending this bowl of soup to Priya's event 'Healthy Me and Healthy Us'. Chowder according to Wiki, is typically a sea food or vegetable stew. The richness to the chowder is primarily due to the addition of cream and/or milk. But in the case of Corn Chowder, the thickness is imparted by potatoes and corn itself. Since I was intrigued by the recipe which I found here, I decided I should adapt the recipe to suit my taste. Here is the finished product for Day 2 Week 3 of BM #26, which was very hearty for a rainy evening! In a deep heavy bottomed pan, heat olive oil and saute the grated/minced garlic for a few seconds and saute the onions until they are golden brown in color. Add the remaining vegetables (carrots, potatoes, corn and celery) and a cup of water. Let the vegetables cook until tender. Scoop out half of the vegetables and puree them. Pour the pureed vegetable into the pot adding all the spices and herbs (salt, pepper, thyme and rosemary). Pour in the vegetable stock and let the soup simmer for about 10 minutes. Remove from heat and squeeze in the lime juice and garnish with chopped cilantro. I chose to make Soups and Salads for the 3rd week of BM #26. I have had this tempting recipe in my email from a dear friend for a while now. So when this theme was amongst the ones I planned to choose, I got a chance to try it out much to our delight! I have seen multiple variations of this Lebanese Salad on the web and it has been referred to as a wet bread salad! I guess it can be fine tuned as per individual preferences. So check out my version for Day 1 Week 3 of BM #26. Shrikhand happens to be a very popular dessert in Western parts of India. I have tasted it at a friend's place and was surprised that the process was so simple for such an elegant dessert. After a prolonged thought process, I decided I would give this Shrikhand a second chance for today's post. The last time I made it with Greek Yogurt upon my friend's suggestion and none of us kind of liked it [Maybe it is just us who are biased against Greek Yogurt]. So I shelved the idea of Shrikhand for a dessert at home. So check this out for Day 3, Week 2 of BM #26 before I go to make another small batch of this delightful Shrikhand, this time mango flavored!! Pour the yogurt/curd onto a muslin cloth over a utensil and put something heavy on it. Place it in the refrigerator for 4-5 hours and let the moisture drain out. Soak the saffron strands in a teaspoon of milk and warm it a little. The material thus obtained is called curd cheese. Transfer the curd cheese from the muslin cloth into a bowl. Sprinkle powdered sugar, cardamom powder and the saffron soaked milk. Whip them together and chill before serving. Serve as is or along with Puri, Crackers or Corn chips. Go with your intuition! For the second day, week 2 of BM #26, here is a basic dressing recipe which can be used with a whole range of things. I found this recipe in Tarla Dalal's 'Fast Foods Made Healthy'. I made this with low-fat yogurt and thought it would be a very good substitute for cream and egg based dressings commercially available. For Week 2 of BM #26, I have chosen the theme which says I need to pick an ingredient and cook from 3 different cookbooks. An additional complication is to cook from a combo of courses. I have chosen to post a basic recipe, a rice based recipe and an Indian dessert. The ingredient I chose is yogurt/curds. At least in our families, yogurt forms a very important component of a meal. So for Day 1, Week 2 here is a unique rice, which I recently noted from a telugu cookbook, 'Pasandaina Pulao and Fried Ricelu' by Smt. Vasundhara. I thoroughly enjoyed this mint flavored rice but my husband didn't care too much for it. So I guess it is individual preference. I had been on a long break from blogging and hence could not participate in Magic Mingle. I have since come back and ready to delve into the magic, so to say! 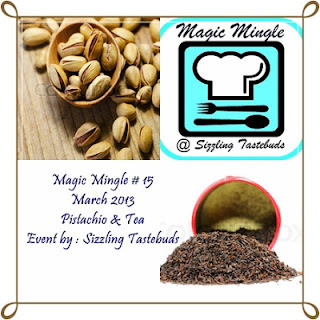 The magic ingredients for this edition of Magic mingle #15 are Tea and Pistachio. When I was thinking about this combo, my first thought was of a biscotti. I was wondering if tea and pistachio could work together in a biscotti when I saw some recipes online which used tea powder. I also had thoughts of using tea decoction in the batter. But I put those thoughts aside. Eventually I used Mystic Vanilla Chai Powder which is sweetened. The result was very good. But I would suggest that the sugar be powdered and milk be reduced to make a stiff dough. Mix the flours, baking powder, vanilla chai powder, sugar, pistachios, cashews and almonds. Mix apple cider vinegar in milk and set aside for a minute. Blend in the oil as well. Preheat the oven to 350 F and line a baking tray with parchment paper. Pat the dough on the parchment paper lined baking tray to form a 1/2 inch thick flat rectangular log. Bake it for 40-45 min. Remove and let it cool for about 10 min. Cut them into 1/2 inch slices and place them in the baking tray with the cut side up. Bake them again for 15-20 min until they turn golden brown. Remove and let them cool on a cooling tray. They will get crispier as they cool. Sending these off to Kalyani's Magic Mingle. Using 'Pasta' as the main ingredient, here is a delightful and kid-friendly snack which is approved by my kids and also the husband. I made it for the first time using left over mac n cheese and my kids literally fought to pick up the last serving. Since then I have prepared different versions of these muffins varying the kind of pasta, the seasonings, vegetables and each time with fantastic results!! So it appears here for Day 3 Week 1 of BM #26. The original recipe has been modified to suit our family. *I powdered 2 bread slices and used for bread crumbs. Cook Macaroni or any other kind of pasta adding salt as required as per package instructions, wash in cold water, drain and set aside. Cook the finely chopped vegetables except onions and set aside. Preheat the oven to 400 F. Grease the muffin plate or any oven safe cups and dust with bread crumbs and set aside. In a mixing bowl, add the macaroni, salt, shredded cheese, pizza sauce, finely chopped onions, cooked vegetables, Italian seasoning, crushed pepper and crushed red pepper if using. Divide the macaroni mixture into the prepared cups or muffin plate, top them with a thick layer of bread crumbs and spray some oil. Optionally top them with more shredded cheese. Bake for about 25 min or until the tops are brown. Cool for a few minutes and let the kids enjoy! I am happy to have come up with this delightful recipe though it was a last minute brain wave. For the 2nd day week 1 BM #26, after lot of mix-up and confusion, and with some inspiration from Srivalli, I tried this fusion recipe. My older one loved it and so did my husband. I am sure I am going to make different versions of this in the near future! I had this cute Annellini pasta at home and so used it for this. I guess, any pasta would work, just that the pasta might need to be crushed a little to blend in with the mixture. Garnish with chopped spring onion. Cook pasta al dente as per the instructions on the package, drain and set aside. Boil the shredded cabbage and carrots and squeeze out the extra water and set aside the water as well. This water can be used as vegetable stock subsequently. Mix in the squeezed vegetables, pasta, chilli-ginger-garlic paste, salt and Sriracha. Sprinkle cornstarch and mix well. The mixture needs to be just about moist. If it is runny, add more cornstarch. Pinch bite sized mixture and roll into a ball and set aside. I got about 22 bite sized balls for the quantity. When the oil is hot enough, fry these in batches until they are golden brown and crispy. Drain onto paper towels. Set aside all the fried manchurians. In a pan, heat oil, fry the grated ginger and garlic for a few seconds and saute the sliced onions as well. When the onions are golden brown, add the tomato-chilli sauce, the vegetable stock, salt, red pepper flakes if using, vinegar(if using) and soy sauce. To this mixture add the fried manchurians and let the manchurians soak up the flavors. Add in the cooked and cooled rice and mix so the flavors blend well with rice. Serve warm topping it with chopped spring onion. 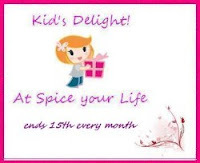 Today we begin yet another edition (#26) of Blogging Marathon, the brain child of Srivalli. There were some tricky themes to choose from and I hope to present some interesting, lovable and hearty recipes. For the first week, I chose 'Pasta' as the main ingredient to present a soup, a rice based dish and a savory snack. So for Day 1 week 1 BM #26, here is a hearty soup when paired with some bread or croutons can make for a delightful supper specially on a wintry evening!! * Cannelini beans, Navy beans or Red Kidney beans are conventionally used. In a heavy bottomed pan, heat olive oil and saute minced garlic. Add onion and saute until translucent. Add in the tomatoes, tomato puree and V8. Sprinkle salt, pepper, basil, oregano and parsley to taste. Let the mixture simmer for about 4-5 min. Mix in the cooked pasta and beans. Mix well and let the soup simmer for about 5 minutes. Serve in individual bowls, sprinkling as much cheese as is preferred.